Your company has fallen from grace. Maybe your CEO was arrested for fraud. Maybe E. coli was found in your food and made your restaurant customers sick. Or maybe you’ve just made some ill-advised business decisions over time, and it’s finally caught up with you. A reputation crisis can be a difficult thing to overcome, but it is possible to repair your reputation. The journey to rebuild your corporate reputation can be summarized in a few key steps: take control of your brand's online presence, know and monitor what is said about you online, and, most importantly, apologize for any missteps. The following roadmap offers a place to begin your journey to rebuild your online reputation. The question is, are you in for the long haul? In any case, you have a damaged corporate reputation. Whether it’s just slightly broken or crushed to smithereens, your reputation needs rebuilding. But just how do you go about starting that process? It’s intimidating enough to assess everything that needs done and figure out the best way to go about doing all of it. First things first, the most important thing is that you start. Starting anywhere is better than not doing anything at all. Having said that, there are good and bad ways of starting. Thankfully, we can look at a long history of scandals and failures to get an idea of what works and what doesn’t. There are some golden rules to be aware of when you’re starting down the road to reputation recovery. It’s not so much a step-by-step process as it is a fluid and changing path. You’ll have to navigate new obstacles and maybe even change course, but it’s all part of piecing together a shattered reputation. With all of that in mind, let’s take a look at what you need to do to rebuild your company’s reputation. First, take a step back and survey the extent of the damage at hand. There are many ways to do this, but here are a few of the most important methods of monitoring collateral damage. You need to keep a vigilant eye on the type of press you’re getting. This will often influence your overall approach, as the perspective of the press can give you insight into how your business is and will be viewed. For instance, if there’s an overwhelmingly negative attitude toward your business, you’ll need to work a bit harder to restore your reputation. If the publications containing negative information are considered "strong" then it'll be even harder to fix your reputation. If press seems mixed, that could mean the situation may more easily blow over, and it can also mean that the efforts you make will be better received. This way, you can gauge how positively (or negatively) your business is being represented in media. It’s important to be aware of a concept called the awareness threshold that we’ve mentioned before. The awareness threshold is a minimum amount of media coverage, so if your company is below the threshold, it won’t get sufficient media attention to broadcast your reputation recovery efforts. Furthermore, about 35% of all coverage should involve company representatives. This is known as Share of Voice (SOV). Whether you get it by publishing bylined articles or just by being quoted in a news release, SOV is critical when rebuilding reputation. Once you've done your research, you might consider creating a spreadsheet to record media coverage and SOV. This is a great way to track how your business is being represented. Once you have an idea of your current status in the public eye, you can make plans to improve it. After an incident of any sort, what your customers think of you is just as important as how the press is treating you. Keeping your finger on the pulse of your customer base will help you get a sense of how many of your customers have stayed and how many have left, which of course affects overall revenue. Often, a good first place to check is your customer support inbox. If you’ve received an influx of messages from disgruntled customers (or ex-customers), that’s a red flag. If this happens, have your support team go through the comments and save them in a document or spreadsheet - look for common traits and rank them. Make sure to actually respond to your customers too. In the midst of a fiasco, the last thing you want to do is dodge customer concerns. Next, check the comment section of any big news release. If a post from the press has gotten significant traction, people will often be commenting on it. Your social media pages are also good places to look for comments, positive and negative, and don't forget to check to see if anyone has direct messaged your company on any platform. (Sometimes folks choose to send more unrelenting feedback through private channels). Depending on the magnitude of the situation, you may want to connect with your investors and stakeholders. Apologize for what happened, and let them know what you’re doing to resolve issues. If you’ve lost anyone along the way, reach out to them and acknowledge wrongdoing in a formal apology. People on Reddit deserve a special mention. When Reddit gets hold of something negative it can snowball quickly. Redditors are often unrelenting. The fact that Reddit.com is a very strong site, with a lot of often refreshed content, and outbound links to often negative content, can cause enormous issues for brand reputation. Where in some cases content can be deleted, this is usually inadvisable for Reddit. In connection with this, if there’s any information that your company feels would be important to investors and stakeholders, consider filing a Form 8-K. These are only needed when a “material breach” occurs, and in most cases it won’t be necessary. Still, it’s a good idea to do some research and see if a Form 8-K could benefit you. After you’ve analyzed the landscape of damage, start the restoration process by focusing on all communication channels you own (and control). This includes your website, social media pages, and other Internet properties. Your full control over these channels will come in handy. Start by issuing a formal apology letter on your website and reference it on all social media platforms. While you obviously want to put a positive spin on the apology, don’t sugarcoat what happened. Write a straightforward apology that’s genuine. Be brief and factual about what happened, and focus on the future. Ditch the jargon, own up to your mistake(s) and tell your audience what you’re doing to make things right. Publish it ASAP on all your channels. There are a few options here. 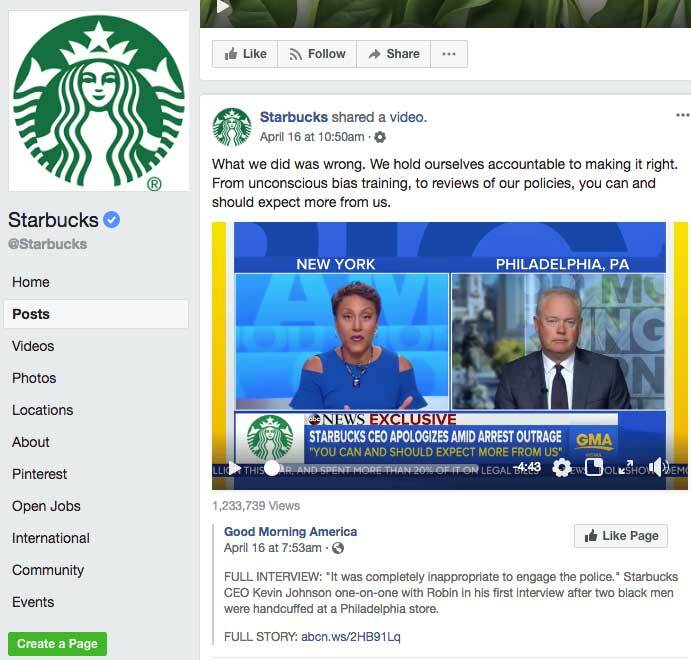 For example, you could take the route Starbucks did by sharing two videos of its CEO apologizing for a racial bias incident. Next, be sure to provide updates on the situation as time goes on. Don’t leave anyone in the dark; if you do, you could catch flak for it. As you take steps to remedy your mistakes, broadcast your actions on all the channels you own. Regular and transparent communication with your audience is crucial. Have a reputation playbook, even if it's ad hoc. That way your customer service people will be on the same page. Have your support or marketing team respond to comments and assure people that you’re doing everything to rectify the problems at hand. Remember, be human. Your apologies, updates, and all other coverage of your restoration should be heartfelt and empathetic for all those affected by it. Don’t try to cover up the situation with vague buzzwords or corporate jargon. If you want to make it through these trials, you’ll have to humble yourself and take a human-first attitude. So far, you’ve promised that you’ll make things better. Now it’s time to deliver. 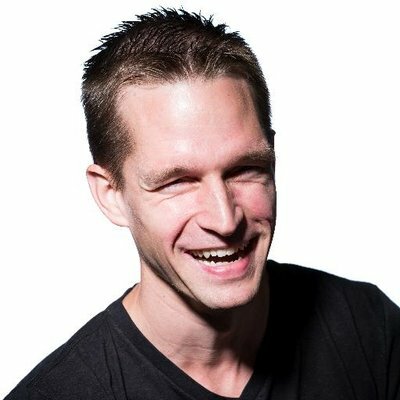 Your reputation PR and marketing teams should work together to create a systematic recovery roadmap. Take all the feedback from customers, investors and the general public and form a step-by-step recovery process. Let me give you a hypothetical example that you can relate to. For this example, I’ll call our fictitious business Joe’s Coffee. Let’s say Joe’s is a nationwide chain and it recently fell victim to a data breach. Using this article as a guide, Joe’s should begin by assessing the extent of the damage. First, Joe’s would need to take a look at the actual event itself. How much personal data was accessed? How safe is it at the moment? Next, what is the media saying? Are they inflating data or sensationalizing crucial info? Is the press taking a positive, neutral or negative approach to covering the breach? Joe’s should then see what its customers are saying and reach out to investors and stakeholders as well. Finally, Joe’s should publish apologies across all Internet channels and platforms and then get to work on fortifying their security systems and making sure no customers are at risk. The surest path to recovery is to deal directly with the negative content that has led to the corporate reputation blowup in the first place. In fact, rebuilding a damaged corporation is largely a matter of replacing negative content with positive content. There is no better way to do that than to do a good job and let the public do it for you. But sometimes you need the help of reputation specialists who work behind the scenes to change the visibility of negative content. When I say negative search results, I’m referring to the results that come up on search engine results pages (SERPs). 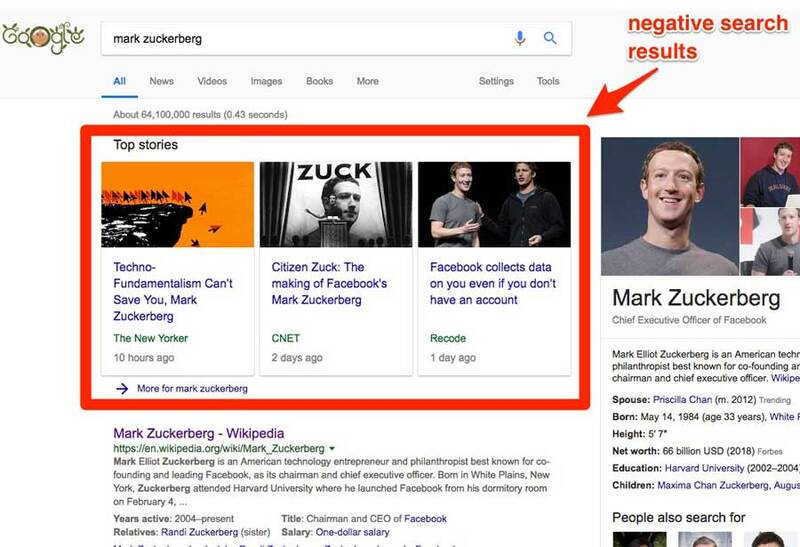 If you’re dealing with a ruinous corporate reputation, there’s a good chance that a lot of your search results are negative. However, with some effort and time, you can push down these results and replace them with positive ones. The bad stuff will still be out there, but you can definitely take over page 1 of Google, which is as far as most people search anyway. While it’s technically possible to remove negative search results, it’s not common. There is a small handful of very specific situations that legislate the removal of online content. Even with such legislation in place, it’s foolish to think that negative content, especially of a compromising or salacious variety, will simply vanish. (Denizens of 4Chan will make sure of it). 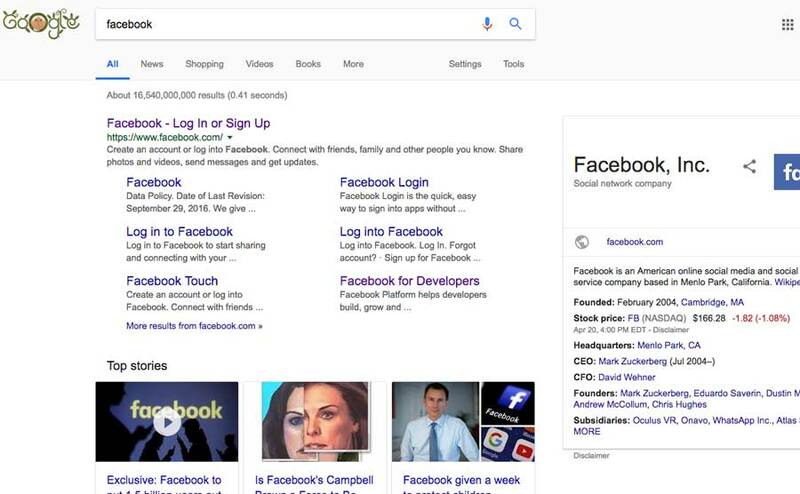 The best approach and the one that has worked ever since the dawn of the Internet’s search engine is suppression — making sure that the content appears at the top of the search results is not negative. The more evergreen content that positions your company in a credible and favorable light, the better. The specific type of content depends on the type of incident. If it revolves around an individual (like your CEO), you’ll want to focus on biographical info. I’m talking about making a site for your CEO, including a biography on your company’s website, setting up a Wikipedia page––the whole nine yards. If the incident is about the corporation as a whole, you should focus on informational evergreen content (e.g., longform articles). 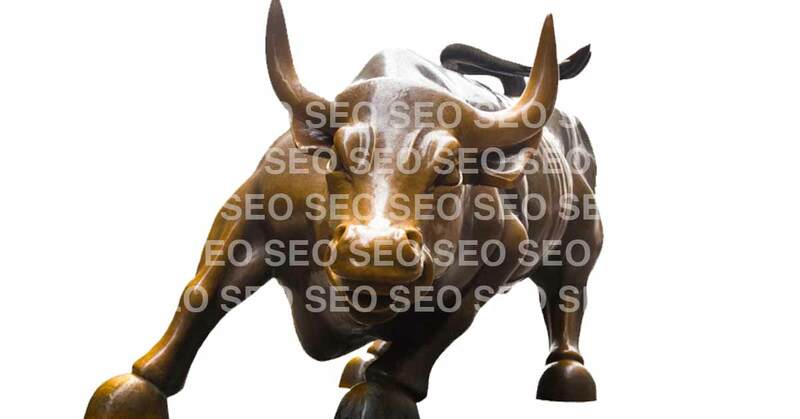 Your company’s blog and other blogs are great places to publish this sort of content. You can also consider press releases to reflect any positive company news or progress. You don’t want bland, pithy posts replacing negative news. It’s much better to opt for a positive tone any chance you get. The sky’s the limit here. Sing the praises of your corporation in a white paper. Publish super in-depth content relevant to your niche on your company blog. Land guest blogging opportunities where your knowledge can shine through and help others. Take every opportunity you can to let people know that your mission is to improve people’s lives. Rebuilding a damaged corporate reputation is no easy feat. The media loves to watch businesses fall, and some people will do everything in their power to keep a company down. Why? Because it converts to page views and ad clicks. The good news is that it is possible to recover. The evidence of your past mistakes may be out there, but you don’t have to live with the consequences forever. It might take more time than you think, and it will require a lot of effort, but by taking the right actions, your company can be just as respected and renowned as it once was.